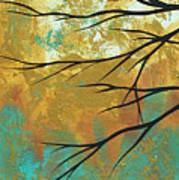 There are no comments for Golden Fascination 1. Click here to post the first comment. 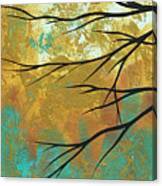 Stunning, Bold colors of trendy turquoise, rust and golden yellow make this enormous painting PoP! The black barren silhouette of a tree creates contrast against the heavily textured Metallic Gold overlay in this original artwork. This painting will be sure to enhance any home or office decor with brilliance and vividness! The original set of 5 pieces is available for purchase.- Images are available for art licensing across all product categories.